Servatec range meets the requirements of the breeders in terms of performance. It ensures them the best nutrition in order to prepare successfully their future dairy cows. 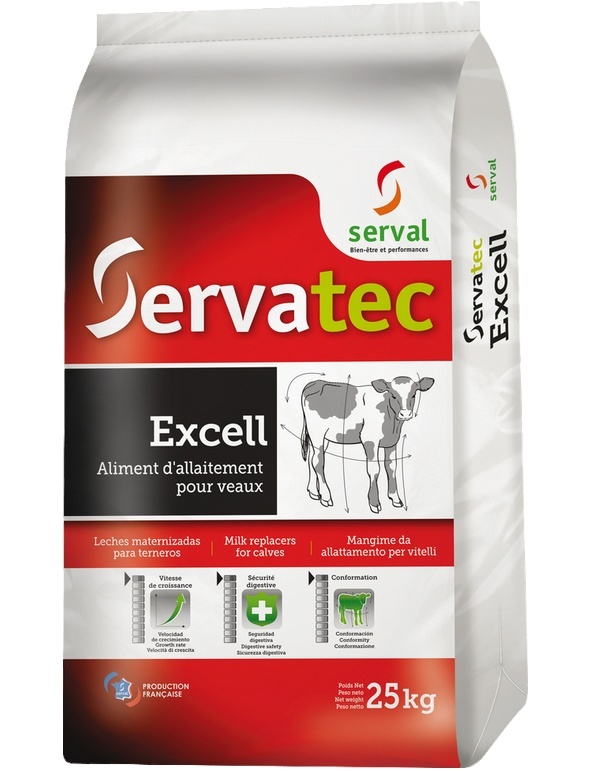 EXCELL is a very high nutritional value feed with a good digestibility. It provides both the best growth performance (speed and conformation) and perfectly homogeneous. A feed with 100% ultra digestible and ultra palatable milk proteins. A low temperature pasteurised powdered milk (low heat) to ensure the integrity of the proteins and thus ensure optimal coagulation (quick and firm) in the abomasum. 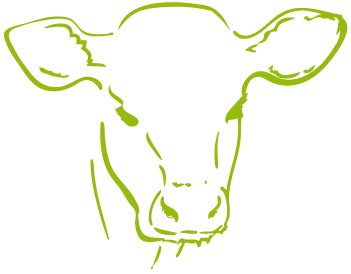 The presence of probiotics to reinforce the ability to fight stress. Benefiting from the expertise and quality requirements of Serval, the Verpre range meets the needs of stock farmers seeking to optimise weaning costs under good growing conditions. 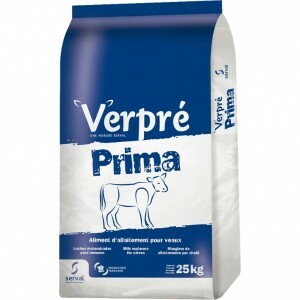 Verpre PRIMA is a milk replacer that combines milk proteins with the best soluble vegetable proteins to provide the perfect balance between performance and economy. Benefiting from the expertise and quality requirements of Serval, the Verpre range meets the needs of stock farmers seeking to optimise weaning costs under good growing conditions. 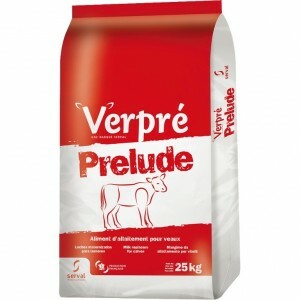 Verpré Prelude is a skimmed milk powder based milk replacer that is rich in dairy proteins and offers an ideal balance between the qualitative and competitive requirements of breeding. Servalor range meets the needs of livestock farms primarily seeking carefree weaning, in a range of growth and conformation adapted to their investment. 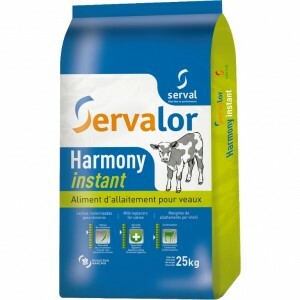 Servalor Harmony Instant is for “technical” stock farmers seeking an optimised performance/cost ratio. High dairy protein levels that give the ration a perfect nutritional balance from the first drink. 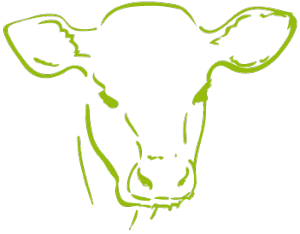 The presence of probiotics to reinforce the ability to fight all forms of stress. Specially designed for simple, easy use, the specific technology used makes it possible to ensure nearly instantaneous dilution of the feed when mixing. Servalor range meets the needs of livestock farms primarily seeking carefree weaning, in a range of growth and conformation adapted to their investment. 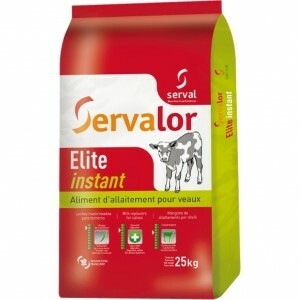 Servalor Elite Instant is a high nutritional value feed that allows regular and harmonious growth of the skeleton and muscle mass of heifers or young bulls. Rich in skimmed milk powder, it's naturally palatable. The combination of fats (rich in short fatty acids) ensures perfect digestibility and quick available energy intake. Prebiotics promote better regulation of intestinal flora. The specific technology used ensures easy and nearly instantaneous dilution of the feed when mixing.